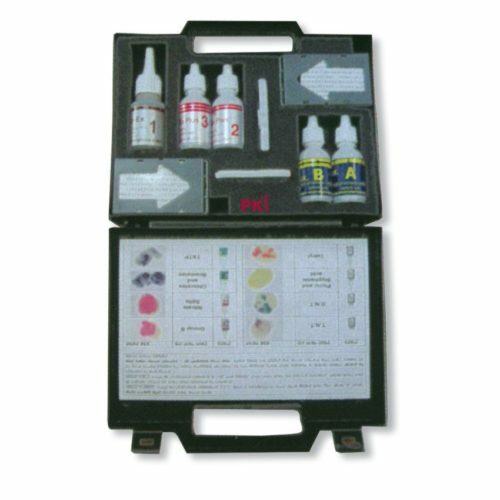 With this set it is possible to identify all known and improvised explosive compounds. An instantaneous colour change indicates the type of explosives, even Semtex H. No special training is necessary. The set can be used indoor and outdoor independently from the climatic conditions. Even smallest quantities like 20 nanogram explosives can be identified. The complete set is supplied in a hardcover case of 1,4 kg weight. The PKI Explosives Identification Set is our newest detection and identification system for explosives. It detects a maximum of different types of explosives due to its capability to identify also improvised explosive compounds namely explosives based on chlorite and peroxide. These explosives based on peroxide are very strong substances which can be produced with chemical substances that are openly sold. Presently terrorists often use this sort of explosives, that is commonly known as TATP (Tri Acetone Tri Peroxide). Group B: (nitratester and nitratamine) This range comprises dynamite, nitro glycerin, RDX, C4, PETN, Semtex H, nitro cellulose and non-fuming powder. Remark: Most plastic explosives belong to this group. Group C: anorganic nitrate ( nitric acid). Explosives based on nitrate, such as ANFO (Ammonium Nitrate fuel oil), commercial and improvised explosives, which are based on anorganic nitrate, black powder, radiance powder, potassium nitrate and ammonium nitrate. Choride and bromate comprising explosives based on potassium chloride and sodium chloride. Explosives based on peroxide comprising TATP (Tri Acetone tri Peroxide) and HMTD.